Empowering voters in Texas! Spread the word! Encourage everyone you know—your family, friends, co-workers, neighbors to vote in the Texas General Election. 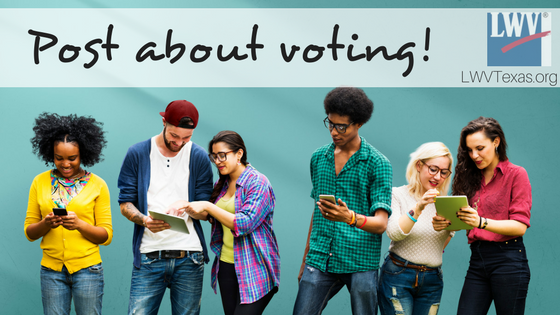 Share the League's nonpartisan voter education media! Check back as the election gets closer for more graphics and videos to share! Right-click and save the full-size image to your computer or device. Upload the image to your Facebook, Twitter, or Instagram account. General Election voter education videos are available on our YouTube page and on our Facebook page. Share Texas voter education handouts and graphics!